This week I chose to highlight an artist who definitely tops my top ten list of favorite artists of all time (Now, that’s a great idea for a post, huh?). 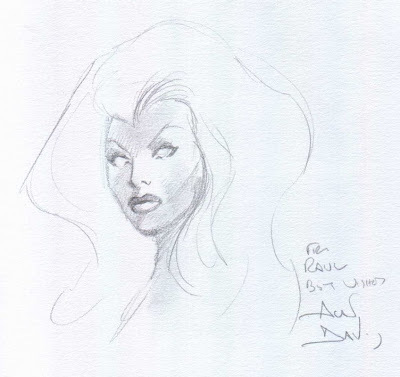 The majestic sketch of Storm above is by none other than living legend Alan Davis (I previously posted a cover image of this month’s Black Panther here)! Whoever Raul is, he’s earned my jealousy for having this sketch! Davis has a way of making his women serene and strong. I love how immaterial he chose to draw Ororo’s hair here. It looks like wisps of clouds. The pursed lips, the arched eyebrows, the high cheekbones, it all adds up to a lovely portrait of our Wind Rider. I got this image off of Alan’s website and had to post it because it really showcases Storm’s fierceness as well as her emotional reserve. I believe Alan designed this outfit and I like most of it except for the sash belt (althought the lightning bolts on each side of it are a nice touch). Storm looks grounded in her commune with the natural elements at her command. I love her African features, the solidity of the tiara’s shape and the foreshortening of her arms. Her hair mirrors the slant of the rain as well! Perfect! Another image I obtained from Alan’s site features Storm in her 90’s costume with Colossus and Wolverine. Alan somehow makes the baggy sleeves and shoulder pads (not to mention those huge X medallions) into something smooth and beautiful. I think he and Jim Lee (who I believe created this costume) are the only artists that consistently draw this costume well. Look at how the sleeves twist and turn like Storm’s hair and body. Alan knows how to make each characters’ lines reveal who they are. For instance, Storm literally looks like she is the wind. She is twisting like a tornado. Colossus is a shiny hunk of metal, both top heavy and kinetic and Wolverine’s pointy elbows and taut neck muscles reinforce his sharp claws. Together, their body posture literally breathes action and movement. Amazing! 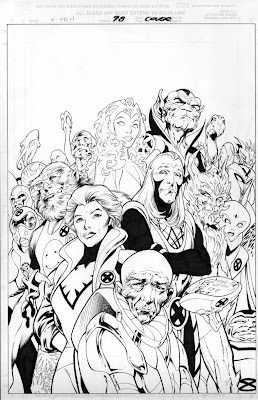 I had to include this amusing piece of cover art because in the midst of all of the possible future X-Men selves is Storm as an elemental, literally composed of the wind and water she commands. It’s a tiny moment, but it’s worth it to think about what Storm’s future might hold. She’s so powerful and the possibilities are endless. Do you see old man Gambit and bald Beast in this picture? How about Iceman? 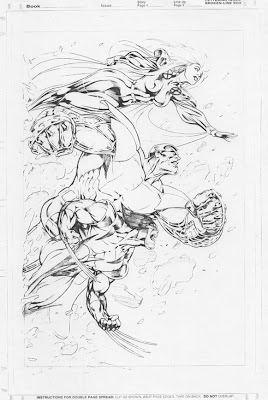 Alan Davis draws amazing aliens and here he just let out all the stops. Make sure you check out Alan’s other work on his site for more amazing artistic storytelling!